On 19th May, 1939, Neville Chamberlain made it clear that he was unwilling to form an alliance with the Soviet Union. Stalin now realized that war with Germany was inevitable. However, to have any chance of victory he needed time to build up his armed forces. The only way he could obtain time was to do a deal with Hitler. 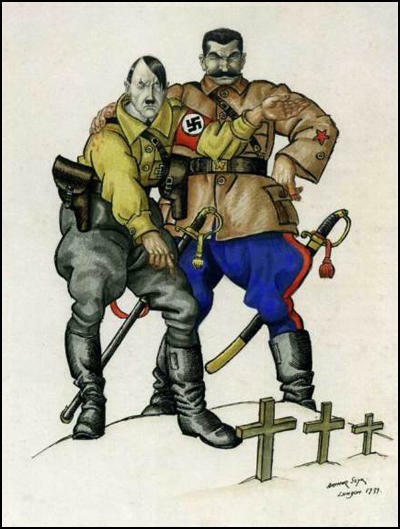 Stalin was convinced that Hitler would not be foolish enough to fight a war on two fronts. If he could persuade Hitler to sign a peace treaty with the Soviet Union, Germany was likely to invade Western Europe instead. In September 1942, Szyk’s mother and brother were seized from the Lodz ghetto and murdered at Chelmno Extermination Camp. (25) By this time it had become clear that Adolf Hitler was determined to destroy the Jewish community in Europe. 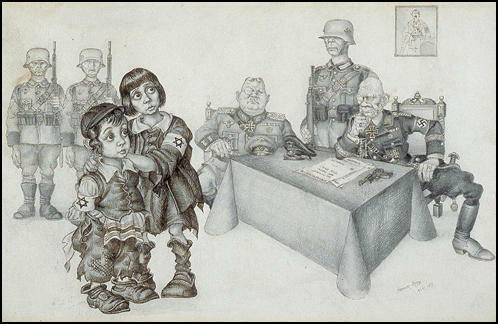 (26) In the PM newspaper Szyk produced a series of cartoons on what became known as the Final Solution. By John Simkin (john@spartacus-educational.com) © September 1997 (updated February 2016). Despite the fact that there is a price on his head and that he is regarded as a dangerous enemy to Germany because of his satrical political cartoons which have appeared in European and North American publications. 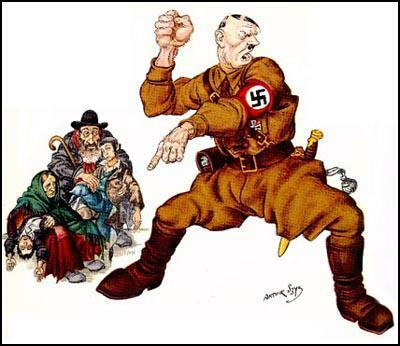 Szyk (it’s pronounced shik) was a Jewish caricaturist who spent roughly the last decade of his life in the United States. He’s unknown here, hardly familiar in America. Born in 1894 in what is now Poland, he fought with the Russian Army on the German front in World War I, then moved during the 1920s to Paris, like many young artists. There he studied at the Académie Julian, declining Modernist abstraction for an old masterly, illuminated-manuscript, miniaturist style of eye-straining detail. Perhaps he was influenced, or fortified, by the “return to order,” as neo-Classicism in that era was called. In any case, from Paris he went to London and onward to New York, having established a reputation with several exhibitions. 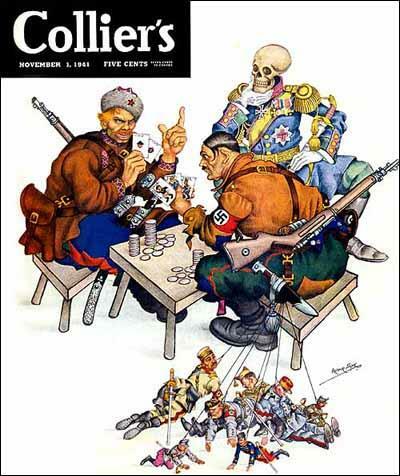 During the 1940s he became famous as a popular illustrator of books and magazine covers for Time, Collier’s, Esquire and others, and as a political cartoonist for newspapers like The New York Post and PM. Several generations of Americans grew up on his versions of Mother Goose and Andersen’s Fairy Tales. 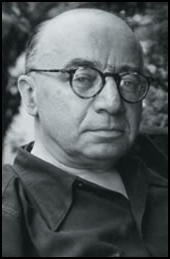 His life’s work, though, was crusading against the Nazis and, later, for Israel and civil rights. Notwithstanding his influence on comic artists like Art Spiegelman, and the occasional Szyk show, he has pretty much dropped down the memory hole today. Naturally, the show here, introducing him to a German audience, focuses on his antiwar agitprop. There are works about the Holocaust, about Israel and America. 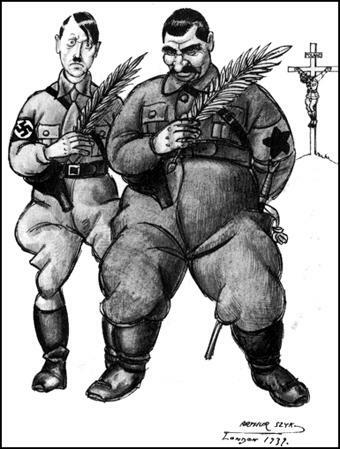 Most of the drawings, reproduced magazine covers and other illustrations mock Hitler and Mussolini. They turn Goebbels into a skunk, Göring into a fat Cossack, the aged Marshal Pétain into Pierrot, the sad clown, and the Japanese into bats and gorillas. To picture his style, think of Mad magazine in the heyday of Will Elder and Harvey Kurtzman but without any sense of humor. Szyk, it seems, had absolutely none. This inclined him toward cloying kitsch when he extolled Israel, and it produced corn when the subjects were cowboys or George Washington on horseback. Szyk thrived in angry mode, tackling enemies with a sledgehammer, saving subtlety for his penmanship. In his dexterity he recalls a bygone age of monastic scribes slaving over parchment pages. Illustrations like Fortress Europe, Wagner and Ride of the Valkyries are more intricate than Swiss watch works and sublimely obsessive. Reproductions hardly do the original drawings justice. The wow factor lent weight to his message, never mind if the one actually had nothing to do with the other. At the same time, however, Szyk exploited the grosser virtues of caricature to knock viewers over the head with his point so that no one could get lost in the exquisite details of a drawing, or rather so that people might lose themselves in the details only after having absorbed the main idea. 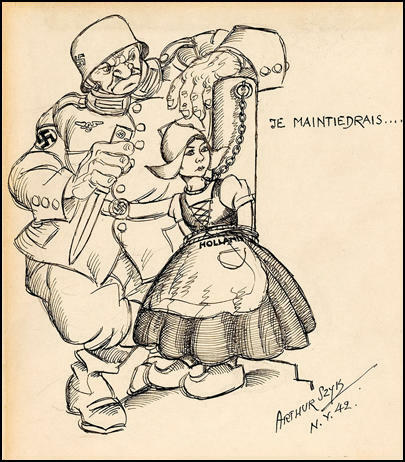 One of his most potent drawings is The Babykiller (German Airman), a straightforward portrait of a skinny, slouching, vacant-eyed Wehrmacht soldier in an oversize uniform, hands demurely guarding his crotch. It’s the banality of evil personified. In such a case Szyk rose to the level of a Daumier or a Rowlandson. And times change, along with fortunes. Szyk’s did. 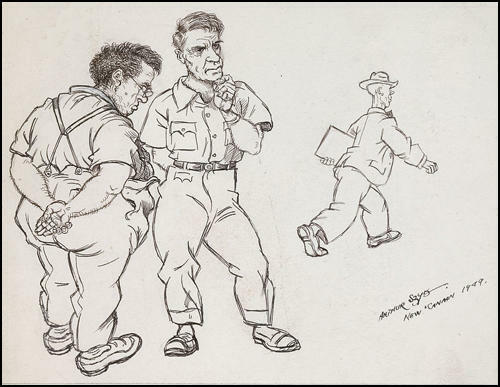 In 1949 he drew two men watching a third walk away: “He is under investigation,” the caption says. “His blood is red, and his heart is left of the center. ... To think of it, we are all in trouble....” Two years later, after the House Un-American Activities Committee began a wrongheaded investigation into his possible Communist ties, he died at 57 having just produced the most beautifully illuminated version of the Declaration of Independence, a testament to his patriotism. Condemning Germans to eternal hell (he inscribed one of his illustrations, about the Polish Ghetto uprising, “to the German people, sons of Cain, be ye damned forever and ever”), he now re-emerges in a Berlin museum of German history. There’s an object lesson in this about the vagaries of life and art. On both sides of the Atlantic, in other words, Vergangenheitsbewältigung still has its benefits. 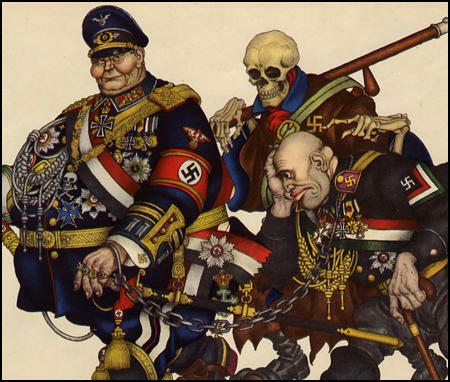 A superb characterization by Arthur Szyk (1894-1951) of how Hitler and the Axis powers viewed the New World Order. 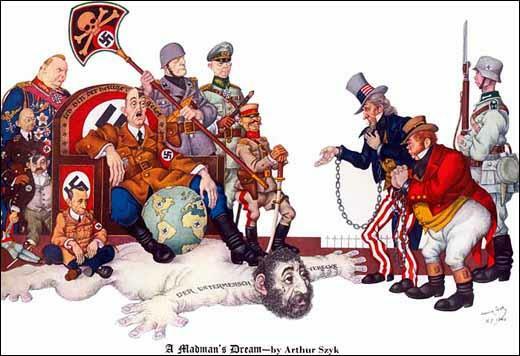 As well as Hitler seated on the Untermensch rug - while Uncle Sam and John Bull plead in chains - appear (from right) Tojo, a German field marshall, Mussolini (with fan), Göring, Himmler, Laval (with a puppet Pétain) and Goebbels. (The wording on Hitler's throne reads: I am the Holy Ghost.) 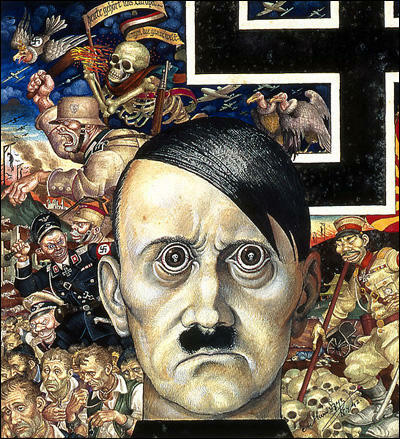 Szyk, who was born in Poland, fought in the Imperial Russian Army in World War I and worked as a cartoonist in England in 1939 before emigrating to the United States the following year. There are three leading motives in the exhibition: the brutality of the Germans – and the more primitive savagery of the Russians, the heroism of the Poles, and the suffering of the Jews. The cumulative effect of the exhibition is immensely powerful because nothing in it appears to be a hasty judgment, but part of the unrelenting pursuit of an evil so firmly grasped that it can be dwelt upon with artistic satisfaction. 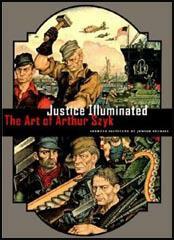 Artist Arthur Szyk (1894–1951) earned an international reputation during his lifetime for his richly detailed illustrations and illuminations of Jewish themes. 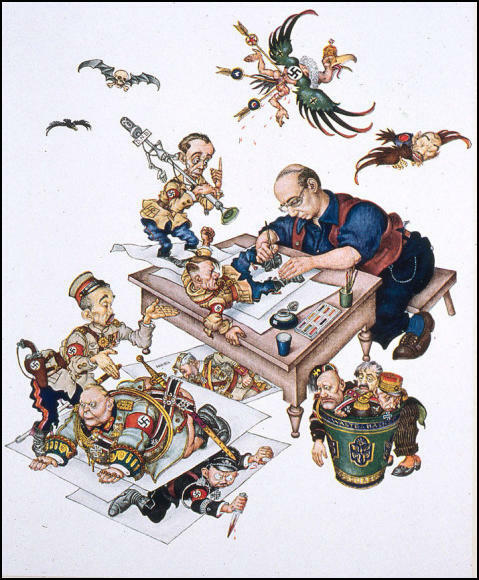 Szyk was a skillful caricaturist and a passionate crusader for political causes. From his early childhood in the Polish city of Lodz until his death in New Canaan, Connecticut, he drew inspiration from the history of his people. Szyk found strength in biblical stories of Jewish bravery and martyrdom, and in more modern examples of courage. 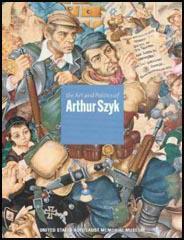 By 1943, Arthur Szyk had become perhaps America’s leading artistic advocate for Jewish rescue from Nazi Europe. His images appeared in leading magazines and newspapers such as Collier’s, Esquire, Time, Look, Liberty, the New York Post, and the Chicago Sun. 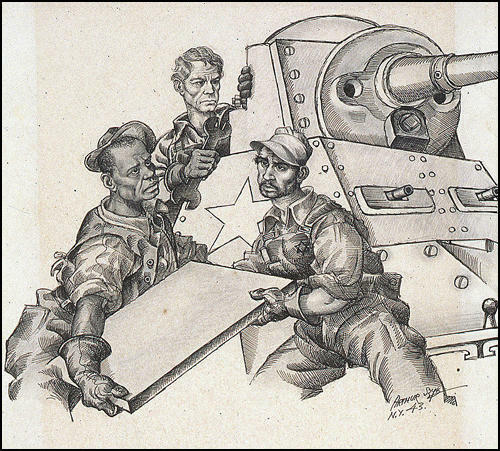 During the darkest periods of the war, Szyk’s images reached millions of Americans, helping to boost morale by unmasking the threat that Nazism posed to Western civilization.